Motivation, motivation, motivation…how much do you have at the moment? If the answer is none at all then don’t panic – you’re in the right place! February is notoriously one of the hardest months to get motivated: the weather is rubbish and the feeling of failure from unfulfilled New Year Resolutions is enough to bring anyone down. But that’s all ok. You aren’t alone and besides now we’re in MARCH and motivation is the name of the game! Spring is on its way (or at least it had better be) and the days are getting longer. Hibernation is coming to an end! Each mini workout is super quick and super effective. All of them can be done in the comfort of your own home, they are suitable for all levels of fitness (harder and easier options given) and you don’t need any equipment – so no excuses! 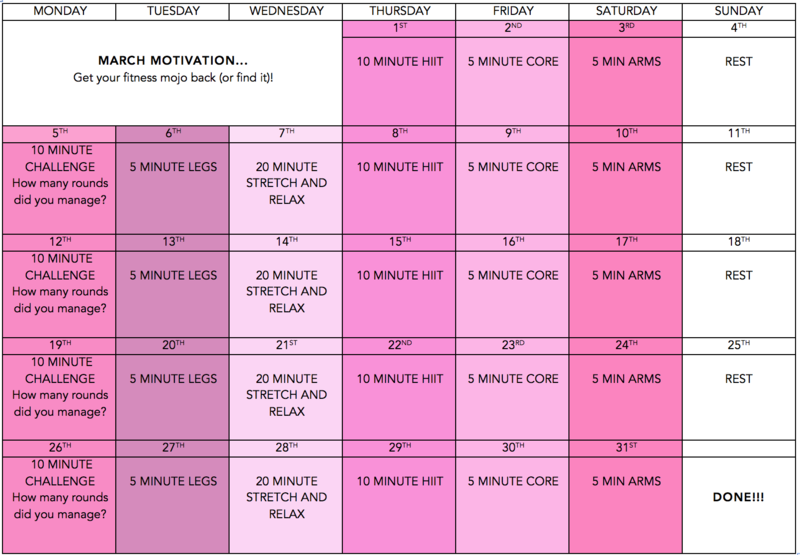 So far this week we’ve already had the 10 minute HIIT, 5 minute core and today the 5 minute arms. Catch up on the NOW! It’ll only take you 20 minutes and it’ll make you feel great for the rest of the weekend.